Best-selling author Jean Sasson tells the dramatic true story of a young woman caught up in Saddam Hussein's genocide of the Kurdish people of Iraq. One morning Joanna, a young bride living in the Kurdish mountains of Iraq, was surprised to see dead birds drop silently out of the clear sky.They were followed by sinister canisters falling to the ground, bringing fear and death. It was 1987, and Saddam Hussein had ordered his cousin 'Chemical Ali' to bombard Joanna's village, Bergalou, with chemical weapons. Temporarily blinded in the attack, Joanna was rescued by her husband, a Kurdish freedom fighter. After being caught in another bombardment and left for dead in the rubble, they managed to flee over the mountains in a harrowing escape. 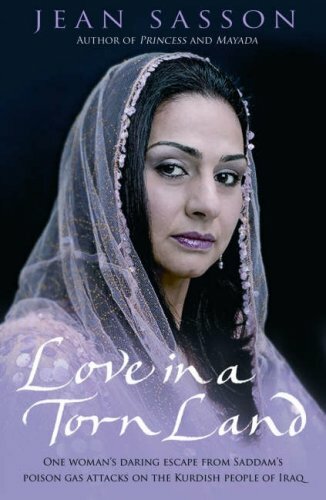 Now living in the UK and working for British Airways, Joanna has told her story to Jean Sasson, the best-selling chronicler of oppressed women's lives in the Princess trilogy and Mayada. 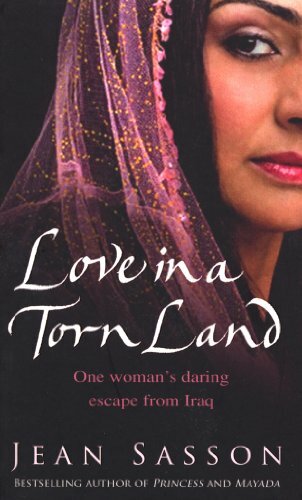 "Love in a Torn Land" is published while the world watches the trial of the notorious 'Chemical Ali', Saddam Hussein's most bloodthirsty henchman, for crimes including the genocide of the Kurdish people. Jean Sasson is the author of the worldwide bestsellers Princess, Daughters of Arabia, Desert Royal and Mayada, Daughter of Iraq. She lived in Saudi Arabia for twelve years before moving back to the USA in 1990. She has recently returned to live in the Middle East.